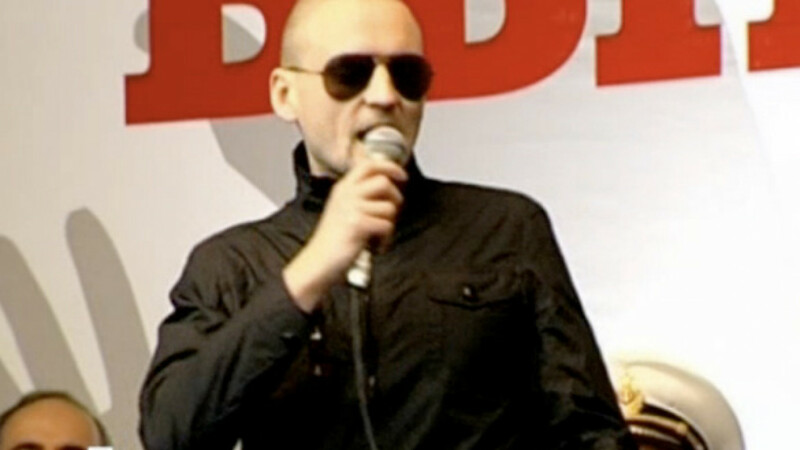 A screenshot of Udaltsov in "Anatomy of a Protest 2." The Left Front leader says he remains under close police surveillance for being an active participant in opposition protests. Prosecutor General Yury Chaika has ordered an investigation into claims in a television expose that opposition leader Sergei Udaltsov received funding from an ally of Georgia's president and the former head of Bank of Moscow aimed at sowing discord in Russia. It was unclear Sunday what the investigation might mean for Udaltsov, who with other opposition leaders like Alexei Navalny and Gennady Gudkov has faced numerous legal problems since initiating an aggressive, anti-Vladimir Putin campaign following disputed State Duma elections in December. But the television expose and subsequent order for an investigation appear to indicate that the Kremlin intends to keep up the pressure on the opposition after approving harsh laws that restrict their activities over the summer. "Anatomy of a Protest 2," which aired Friday on state-controlled NTV, included footage that it said showed Udaltsov, the leader of the Left Front movement, receiving instructions from Givi Targamadze, the former head of the Georgian parliament's defense committee and a close ally of President Mikheil Saakashvili. In a scene presumably shot with a hidden camera, someone resembling Targamadze tells someone resembling Udaltsov that Andrei Borodin, the self-exiled former head of Bank of Moscow, agreed to contribute $50 million to the protest movement. He also promises to get another $150 million from other Russian emigres living in London. "If the investigation uncovers an instance of a law being broken, Mr. Chaika has ordered that prosecutors undertake all necessary measures," Prosecutor General's Office spokeswoman Marina Gridneva said in comments carried by Interfax on Saturday. Borodin, who left Bank of Moscow, formerly controlled by City Hall, in 2011 following the ouster of Mayor Yury Luzhkov, is wanted by Russian authorities on mismanagement charges and currently lives in London. In the video, the Targamadze look-alike mentions that Vladimir Antonov, a former Conversbank head who fled the country following embezzlement allegations, would back the opposition. He says Antonov suggested that militant ultranationalists from the banned Russian National Unity movement should march on the Kremlin. He adds that Antonov had good ties with former National Unity members. Also, he says he's considering a plot to instigate a rebellion in the Kaliningrad exclave that would elicit a military response. Such a situation might create tensions between Russia and NATO, he says. The airing of "Anatomy of a Protest 2" came days after the Georgian Dream coalition, led by Saakashvili rival Bidzina Ivanishvili, won parliamentary elections in Georgia. Udaltsov said Saturday that he did not recall ever meeting Targamadze but that he meets with so many people that the encounter could have happened. However, he denied breaking the law. "An existence of any instances of financing from Western intelligence and … of 'coup attempts' would lead toward the opening of highly publicized criminal cases against me," Udaltsov wrote in his blog on Ekho Moskvy's website. He added that he remained under close police surveillance for being an active participant in opposition meetings. Targamadze told Novaya Gazeta on Saturday that he did not recall meeting Udaltsov or Antonov and dismissed the NTV expose as "propaganda." But, curiously, he conceded that the program's producers "might have taken" the footage "from somewhere." Political analyst Vladimir Prybilovsky told The Moscow Times that even if a meeting between Targamadze and Udaltsov took place it was still unclear whether the footage was doctored. He pointed out that it was difficult to discern whether the actual dialogue matched the presented subtitles. While the person resembling Udaltsov speaks with the opposition leader's trademark husky voice, he is shown from a distance and only his profile is visible. "This film is shown to please the most stupid portion of Putin's electoral base. They can't prove that Putin is good, so they show that others are much worse," Prybilovsky said. On the program, Communist Party chief Gennady Zyuganov claims Udaltsov could be manipulated by "Russian enemies" because of his "passion" for the opposition movement. The leftist Udaltsov endorsed Zyuganov's 2010 presidential campaign. Although he is not a member of the Communist Party, many pundits have said he is a possible successor to Zyuganov. The "Udaltsov-Targamadze" footage was the only new allegation against the political opposition. The other parts of the program essentially repeated previous accusations — such as opposition leader Boris Nemtsov having ties to the U.S. — that featured in the first "Anatomy of a Protest" in March. In his blog, Nemtsov called the recent program "untalented" and said it was targeting the opposition ahead of the Oct. 21 elections for the movement's coordination council, which is expected to represent different opposition groups among them liberal, nationalist and leftist. Some analysts said the program was trying to play on political differences between the various opposition groups, mentioning the existence of far-right elements among the protest marches. President Vladimir Putin, who turned 60 on Sunday, said in an NTV documentary dedicated to him that "sound and interesting people" would appear in the opposition soon. "The outer shell will be swept away," he said.